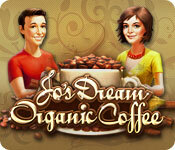 Jo's Dream: Organic Coffee is rated 4.1 out of 5 by 141. 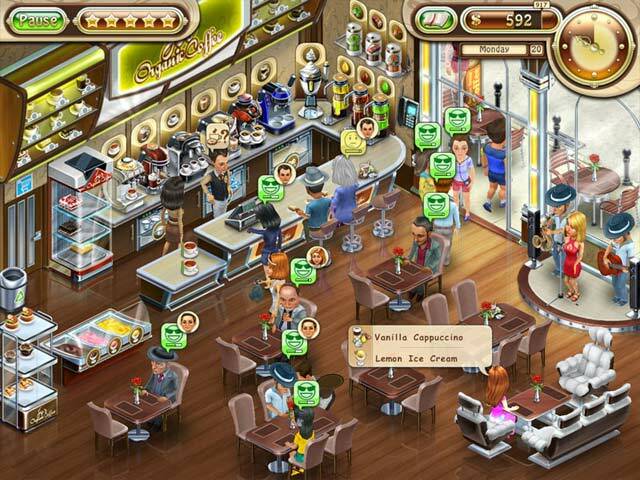 Rated 5 out of 5 by Ruckus777 from Engaging TM Game! This game was fantastic! I got hooked by the first level, I couldn't put it down! (At least not until the end of the free trial!) I was pleasantly surprised by how steadily it became more challenging, instead of the usual dramatic increase in difficulty found in other TM games. The actual game itself had the usual TM mechanics, but I got into the rhythm of the game better thanks to the steady difficulty increase. I liked how you could buy upgrades to the shop to make new recipes, rather than the game automatically introducing them and making it more difficult. It was nice to be able to go at your own pace, for the most part. The graphics and music in this game just made it all the more enjoyable. Overall, I recommend this game! Rated 5 out of 5 by Neko6 from Played Nonstop I have to say this is definitely one of my favorite restaurant/serve games. The addition of staff added a very unique challenge but fortunately, fo those who found it faster to work alone, you can fire your staff at any time. I found the game progressed just fast enough, offering machine and recipe upgrades at an even pace so that I didn't become overwhelmed trying to remember all the recipes. Perhaps the only maddening factor is how agonizingly slow the customers can move; it can take forever and a roundabout way for them to go to a table and finally sit down. But it's a minor annoyance for me, definitely not a deal-breaker. Rated 5 out of 5 by REDFEATHER from Great Game This is a really excellent game, relaxing and fun! Give it a try. Rated 5 out of 5 by michelle1187 from Super Fun Game! I really enjoyed this game. It's fun playing against the clock or even in relaxed mode. 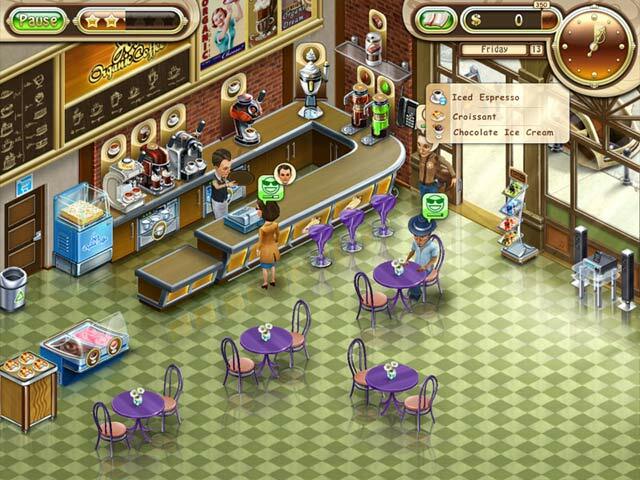 The only problem is every time I play this game I start to crave coffee drinks and desserts :\ . Lol. Rated 5 out of 5 by Deeisme from A Dream of a Game! WOW, at long last, a time management game that really has a ''relaxed mode''! I can play this game fast because I do not feel so rushed and worried that I will not meet my goals in a timely manner. 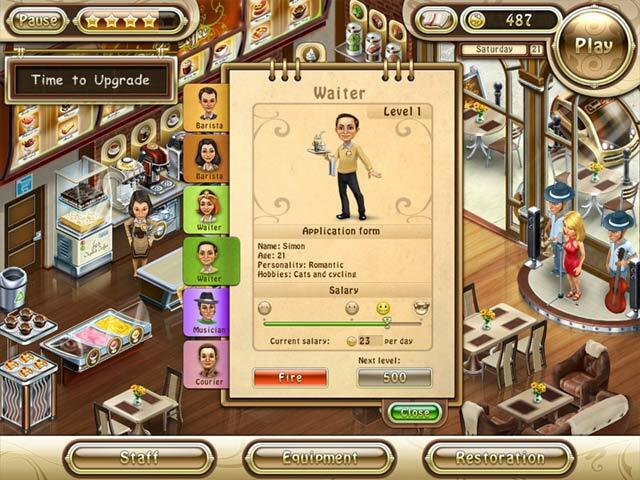 Plus, one of the best things about this game is I can hire people to help me serve the people, the food, coffee, ect ect. Thsi game has some cool power-ups, as well, like hiring a band to play music to make the people happy. And there are many upgrades to the coffee, and food. Rated 5 out of 5 by lemieuxc from Love this game! I got into this game very quickly. I thought at first it might be too hard but with the staff it made it easier to keep up. Like the goals that are needed to be met. and I like the overall look of the game. Also its a huge plus that when you can't remember how to make the drinks there is an easy recipe button. Normally you have to remember yourself and then its impossible! great going! Rated 5 out of 5 by Jpatricia from excellent time management game Played it, loved it, always wanted a coffee when playing this game - when is the next instalment coming out.